As you will have seen from our puzzle list, we have a large range of simple and self-contained word based puzzles. These are ideal for a mixed collection of word puzzles where you wish to have a varied selection of puzzle types, for instance a word puzzles magazine, or computer brain training game. The hourglass word puzzle is visually interesting due to the shape of the puzzle, and very simple. 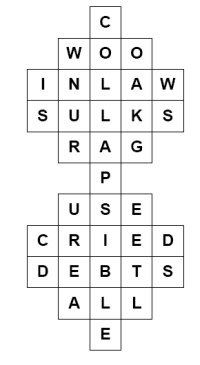 The puzzle requires a word to be entered horizontally in the hourglass shaped puzzle, with the word being the answer to a simple crossword-type clue. As an added piece of interest, once the puzzle is complete, a word will be revealed down the central column of the puzzle. This also means that hourglass word puzzles are an ideal candidate for theming - for instance if you run a magazine on cars then the word revealed down the middle could be 'aston martin' for instance, to theme around the magazine title. If you are interested in buying hourglass word puzzles or indeed any other of our large range of word puzzles, then please do contact us.